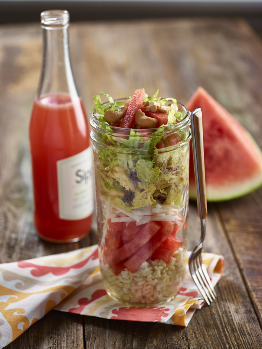 RECIPE: STACKED JICAMA CHICKEN SALAD - What About Watermelon? With all my talk about a New Year’s resolution, I inspired my wife to start her own resolution for 2016. Although hers isn’t nearly as extreme as mine (she wants to get healthier, just like I do), I’ve pledged to help her stick to her goal all year long, starting with this healthy and delicious recipe for Stacked Jicama Chicken Salad. And, by the way, this recipe is proof that eating healthy can also taste amazing. Don’t believe me? Go ahead and try this recipe. I did, and you can bet your last wedge I’ll be cooking it up a few more times in 2016. If you’re not indigenous to Peru or Ecuador (I’m not, either), you may not be familiar with the jicama. Pronounced hee-ka-mah, this bean is common in subtropical, warm climates. It’s usually enjoyed in salads, fruit bars and soups. High in antioxidants and dietary fiber, the jicama is part of what makes this recipe so good and so nutritious. Place chicken breasts in a medium saucepan, cover with water, and bring to a boil over medium-high heat. Reduce heat and simmer until cooked through, approximately 15 minutes, depending on thickness of meat. Remove from water and let cool. Dice. In a medium bowl, blend mayonnaise, chutney and curry until thoroughly blended. Add chicken, celery, onion and raisins. Blend and refrigerate. Divide rice and chicken mixture into 4 equal batches. Starting with the rice, layer approximately ¼ cup of rice followed by 1/3 cup watermelon, ¼ cup jicama, 1/3 cup of chicken. Repeat and top with 1 tablespoon of chopped cashews and shredded romaine. Serve or screw a lid onto jar and refrigerate. UP NEXT: MY NEW YEAR’S RESOLUTION UPDATE!